On the back of this photograph it reads, “May 1950 Jean, Chas III, Chas. Jr.” The Lowry family of three would end up being a family of eleven. If only they had been able to predict the future, the changes they would see! Jean Groucutt Lowry (1924-1987), Charles James Lowry (1924-2007) and Charles James Lowry, Jr. [year of birth withheld], Photograph, taken in unknown location, in May 1950; digital image, photocopy of original, scanned in 2013 by Joseph Lowry; privately held by Mary McCaffrey, [address for private use], Canton, Ohio. 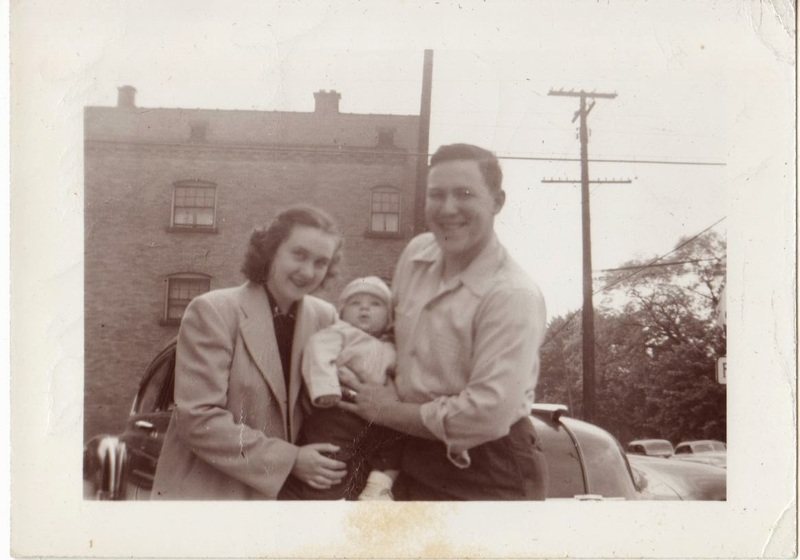 Family of three standing together in front of car with brick structure in the background. Provenance is Charles Lowry family to Mary McCaffrey.